Breaking news in Spain: Juan Carlos I, King of Spain, has just abdicated. If you are in Spain, you won’t hear any other news these days. What are the consequences for Spain? We’ll have a new head on the front of our euro coins; we’ll listen to a different voice in the traditional Christmas speech on the TV on the 24th of December or the Copa del Rey de fútbol (Football King’s cup) winner will receive the trophy from different hands in coming years. The person who will have to do all these tasks will be his youngest son. Felipe de Borbón, who’ll reign with the name of Felipe VI. He’ll assume the crown in the next weeks. The monarchy in Spain is a tradition of centuries. However, this is not the only royal and noble rank that is used in Spain currently. Today, we’re going to learn some vocabulary about nobility and courtesy. La Familia Real (The Royal Family): is formed by el rey (the king) and la reina (the queen). The courtesy tittle for them is Su Majestad (His /Her Majesty); el príncipe o la princesa (the prince or the princess) and los infantes y las infantas (the king’s sons and daughters who are not princes or princesses). Their title is Su Alteza Real (His /Her Royal Highness). 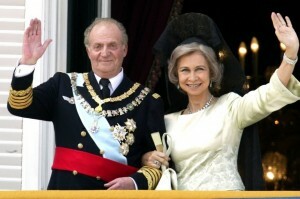 Grande de España (Grandee of Spain): is the highest rank apart from the Royal Family. The tittle they are called by is Excelentísimo Señor or Excelentísima Señora (His / Her Excellency). Other noble ranks: duque o duquesa (Duke or Duchess); Marqués o Marquesa (Marquess or Marquis); Conde o Condesa (Count or Countess); Barón or Baronesa (Baron or Baroness). All of them are called Ilustrísimo Señor or Ilustrísima Señora (His / Her Grace). All of these traditions are very exotic for our students on www.spanishviaskype.com. If you want to learn Spanish and you think you’ll probably talk to a noble Spanish person, you could learn more courtesy tittles with us. Try a free trial lesson via Skype here. Here you can watch a video about Juan Carlos’ I proclamation as king of Spain in 1975.